Ants are the number 1 pest in the gulf coast area. Most people don't realize thet there are hundreds of species in Texas. IDENTIFICATION IS A MUST TO CONTROL ANTS. There are no magic chemicals, baits, or techniques that control all ants. Doing the wrong treatment can cause the problem to get worse. Some most ants will never cause problems for homeowners. 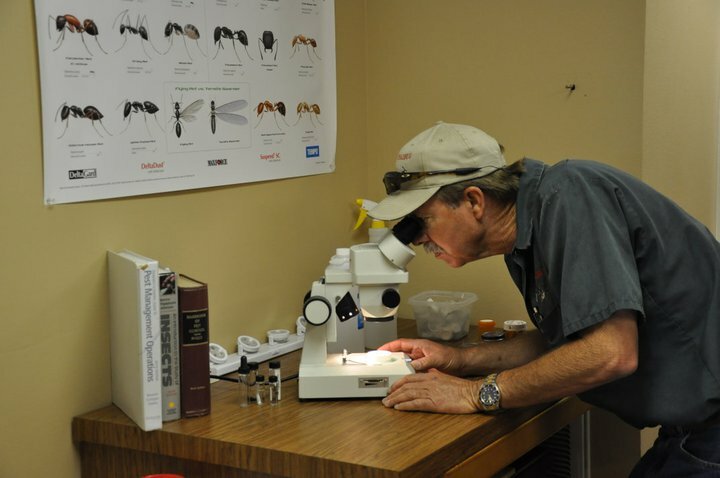 We will address some of the ant species that cause most of the problems in the gulf coast area of Texas. This ant is known for its ferocious sting. Reactions vary from a whelp with a pustule, to anaphylactic shock. Fire ants make dirt mounds found throughout infested lawns. They will also invade homes, air conditioners, water wells, and other areas in and around homes. The good news is Fire ants are fairly easy to control. Rasberry Crazy Ants are known the massive numbers they produce during the summer months(15 to 20 billion ants per acre). Although 98% of Rasberry Crazy Ants die off during the winter months, the survivors nest in the interior walls of homes. The cause of this problem is usually the result of not treating them properly in the summer months. Eradication of this ant is not likely, however we can get very good suppression. Knowledge of their biology, proper product choices, custom treatment programs designed for each property is necessary for acceptable results. These tiny little creatures are fairly new to the Houston area, however they have quickly moved to #3 on our ant list. Ghost ants start in the lawn and end up in the house, usually on the kitchen and bathroom counter tops. We have only found a few products that control this little minus . The good news is one treatment usually controls them for one season. These tiny black ants can be found in most lawn, however they will move into homes. ants are usually noticed first in the kitchen or bathrooms. Baits are the only way that we have found to control this little nuisance. For free ant identification send or bring specimens to our office.